Listed below is a link to the documents we presented at every level of this case – from Superior Court to Appeals Court, to the Supreme Court. Although we were not successful in getting the California Supreme Court to hear our case, I am as proud of the case we presented as Clarence Darrow was of his work at the end of the Scopes Monkey Trial. You will recall that William Jennings Bryan successfully argued that evolution could not be taught in school as humans descended from Adam and Eve in the Garden of Paradise, and thus evolution could not be true. Darrow had countered that evolution was a scientific fact and that religious beliefs or other prejudices should not be allowed to dictate what a teacher in Tennessee could teach in his science class. Darrow went to the end of his career knowing that he was correct and that the law would eventually reach the same conclusion. That’s how we feel at the Academy. 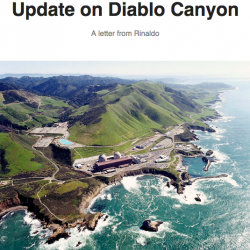 At the end, of the 16 environmental groups that originally requested the Academy to take on the CEQA implications of Diablo Canyon’s continued operation, each and every one of them dropped out along the way as a result of political and financial pressure. The Academy was literally “the last man standing:” the only group that saw this campaign through to the very end – to the highest court of California. We will continue now to focus even more intently on our efforts to move California to a 100% renewable energy economy  as quickly as possible using renewable energy systems supported by a statewide microgrid infrastructure,  including our efforts at the local level supporting Community Choice Energy (CEE) and the Montecito Microgrid. All legal filings for the case can be found here.